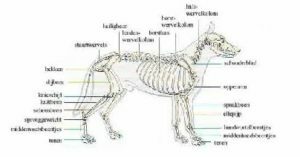 Just like us people, our dog’s spinal column is composed by several vertebrae, and just like us, dogs may suffer from several problems such as misalignment, pinched nerves and herniated discs. Not surprisingly, there are also chiropractors for dogs to help get relief from achy neck and back problems! 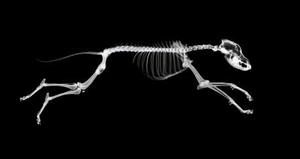 Getting more acquainted with a dog’s spine is not only interesting, but also educational so we can understand what may be going on when dogs develop; neck and back pain. sacral (composed of 3 pelvic vertebrae) and coccygeal (composed of 6 to 23 highly mobile tail vertebrae). In between the vertebrae are several intervertebral disks that provide cushioning &nbsp;and act as shock absorbers so your dog’s vertebrae aren’t rubbing against each other. Other than making your dog’s back flexible, the vertebrae also protect your dog’s spinal cord, a bundle of nerves responsible for relaying information between your dog’s brain and his body. When the discs herniate, it cause symptoms in dogs which are often confused with other conditions. Affected dogs will be reluctant to move and when they move they’ll assume unusual postures and their movements are often not well-coordinated. Pinched nerves in the dog’s neck cause lots of pain and affected dogs may vocalize as they get up or turn their head. When the nerves of the dog’s back &nbsp;are affected, dogs may be unable to walk on their hind legs and may even lose control of their bladder and bowels. Fortunately, when treatment is sought in a timely manner, there are chances that I may recover. Surgery can help remove the disc material that has herniated and is compressing me. If the vet thinks, it’s worth a shot, he may skip the surgery and try to handle things conservatively by allowing the dog to rest and recover. This means strict confinement and cage rest for several weeks so to give my discs time to heal. To help the dog cope with the pain and reduce inflammation, pain relievers and nonsteroidal anti-inflammatory drug (NSAID) are often prescribed. More and more veterinarians are offering chiropractic care and acupuncture for dogs suffering from the chronic effects of pinched nerves in their neck and spine. As seen, I am a very important structure! To sum it all up, I support your dog’s body and skull, I allow flexible movements of your dog’s head, neck, back and tail. I protect your dog’s spinal cord and all those internal organs enclosed within your dog’s rib cage. I offer a place where your dog’s muscles, ligaments and tendons may attach and my vertebral discs act like shock absorbers. With all these important functions, it’s important that you take good care of me! Feed your dog a balanced diet. Keep your dog lean so to reduce stress on the neck and backbone. Invest in a harness rather than a leash to put less strain on the dog’s neck. Prevent jumping by keeping steps next to the bed or couch.